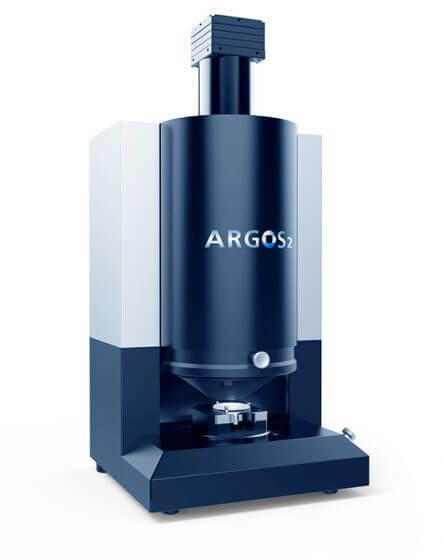 ARGOS inspects many common test objects with a diameter of around 2 to 45 mm or a side length of around 40 mm. The surface recognition analyzes the smallest defects during the running production process. It shows and analyzes holes and long scratches up to the tiniest grade number of 0.0025. The types of surface imperfections that can be recognized also include sleeks, coating defects such as splashes, orange skin, grey coloration/clouding and edge chips. Many materials can be inspected: all common optical glasses, coated optics, infrared optics, injection-mold optics, mirrors and polished metals. The new device design of ARGOS 2 combines robustness, user-friendliness and functionality. The intuitive user interface allows one to select the drawing number using the drop-down menu, which automatically sets all the measurement parameters and enables a fast, batch-based inspection without any set-up times. The innovative EDOF technology enables the scanning of several layers as well as an automatic analysis of curved and complex surfaces. At the client’s request, the combined inspection of the upper and lower side, as well as an inspection to detect bubbles and inclusions in the volume are also possible. The testing ability always depends on the geometry of the test object, specifically on the free diameter D and the radius of curvature R. A relationship D/R<1 can be taken as a rule of thumb for the testing ability. For values higher than D/R, we recommend an investigation of test samples. The different types of specialized equipment that are possible include an autofocus system, EDOF, the dust removal “Flow” using integrated air jets, the calibration standard and different scanning options with linear or XY-table and multi-sample analysis. We are also happy to take on customized adjustments, such as multiple inspections, specialized analyses and automation so that they optimally fit your production process.